Not quite like Lance Armstrong's bike, is it? Although two-wheeled machines had been in use since ancient times, Victorian bicycles changed the world in many ways. At first the bicycle, called a Dandy Horse, had no pedals and the rider merely moved his feet to move forward. By 1840 this design had been improved upon with cranks to the rear axle. This attached the rear wheels to the pedals with driving rods. In the 1860s this changed when Frenchmen Pierre Michaux and Pierre Lallement added a mechanical crank drive. This allowed pedals to be located on either side of the large, front wheel. Finally, in 1888 Scotsman John B. Dunlop invented pneumatic tires which created a smoother, more comfortable ride. 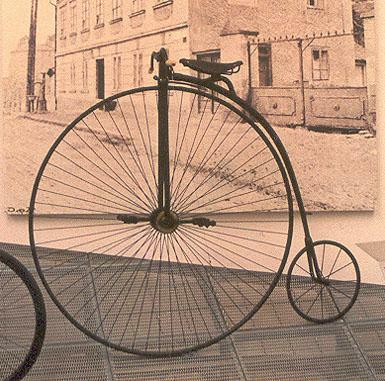 One of the first Victorian bicycle designs was the High Wheel Bicycle. The frame was made of tubular steel. The front wheel was huge in comparison to the back wheel and it was difficult to balance because of poor weight distribution. On some models of this bicycle the front wheel was over five feet tall.Because of the lack of even weight distribution, riders generally spent time recovering from the many falls that they took. In fact, the idiom Taking a header to describe a fall was coined during this time. When a rider tried to stop he often found himself landing on his head on the ground. The Boneshaker was a bicycle that had iron tires for those riders interested in durability. When the rider would ride down the cobblestone streets the iron did not absorb any of the bumping and the rider would be shaken painfully. Victorian society had a remedy for that and created indoor riding arenas called riding academies. These were very much like roller skating rinks and became so popular that a fad was started. In the late 1890s bicycling had become a way of life. People no longer had to walk to get from one place to another but could easily ride there. Bicycles built for two allowed couples to ride together. Bicycles became so popular that they were used in advertising as well as art. Bicycles gave women more freedom. Although a Victorian bicycle could cost as much as 150 dollars (several months' salary) it became so popular that cycling clubs sprung up all over the country.With people riding bicycles the roads had to be of higher quality than they had been and so roadways began to be smoothed and graded. This eased the introduction of the automobile later on. Inner cities became less crowded as workers moved farther out. They now had the ability to commute more of a distance than they had before. It took three times as long to walk somewhere as it did to bicycle there. The country began to enjoy a new freedom. Women, who had been unable to get around without a male companion in the past, had a new mobility in the bicycle. Susan B. Anthony, famous suffragist, praised the bicycle as an emancipator of women. She believed that it did more to give women freedom than anything else in the world had up to that time. Even ladies fashions changed. Women could not wear corsets or bustles when riding a bike. The heavy skirts got caught in the wheels or the chain. Some women began wearing pantaloons much to the shock of their more conservative neighbors. Women's fashions changed forever with the advent of the bicycle. Manufacturing and improving bicycles led to advancements in technology that would affect everything from metal working to the automobile industry. Even some of the technology necessary to create a working aircraft was developed during this time. The bicycle changed society and paved the way for the development of the automobile. It changed the way people lived and gave them freedom that they had not had before. Victorian bicycles are fascinating reminders of a rapidly changing era.